(CNN) -- Authorities have made a second arrest related to a series of arsons in the Coatesville, Pennsylvania, area, the Chester County Arson Task Force said late Thursday. Roger Leon Barlow is one of two people arrested in suspected arsons around Coatesville, Pennsylvania. 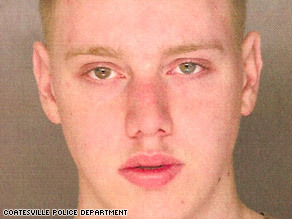 Mark Gilliam, 20, of West Chester, Pennsylvania, was arrested Thursday on a federal charge of attempted arson in the town of Thorndale on January 25, authorities said. Gilliam was arrested at his residence without incident, according to the task force. Gilliam is expected to have his initial appearance on Friday in U.S. District Court in Philadelphia, Pennsylvania. His bail was set at $9 million. Special agent Mark Porter of the multi-agency task force that has been investigating the fires said the group is still investigating the other blazes and will "continue our efforts until everyone is brought to justice ... and we can bring some sense of peace to the city." The task force would not comment on a possible motive, but Carroll said he does not suspect Barlow of a hate crime, classified as targeting an individual group or gang-related activity. CNN's Deb Feyerick and Kristen Hamill contributed to this report.